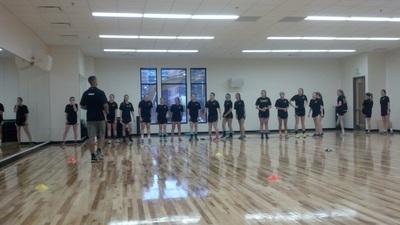 This is the home of the Colorado Women's Club Lacrosse program. Our team is operated and supported by student athletes who have the responsibility of fulfilling all managerial aspects including organizing, scheduling, and fundraising. 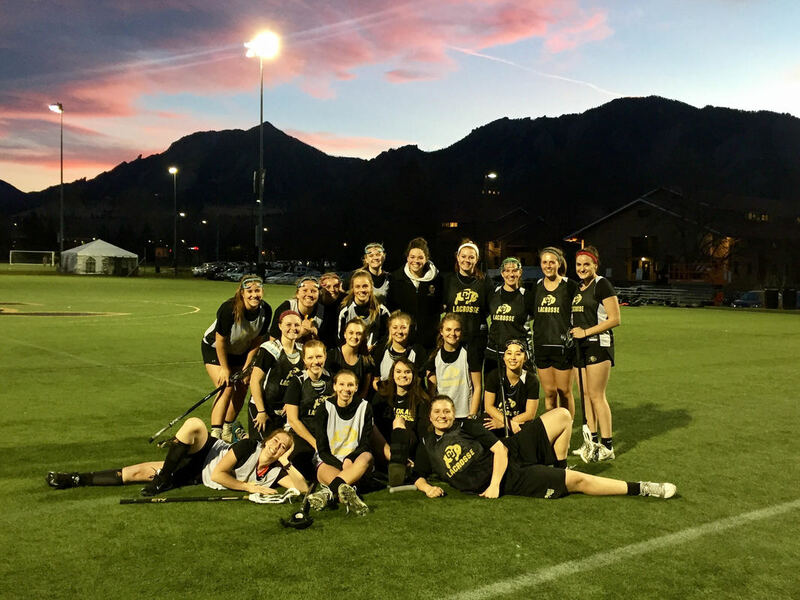 The University of Colorado Boulder Women’s Club Lacrosse team is a member of the Rocky Mountain Women's Lacrosse League (RMWLL) and competes nationally as a Division I team in the Women’s Collegiate Lacrosse Association (WCLA). The buffs are headed to nationals as the 14th seed. We are so excited to show Virginia Beach what we've got and finish out the season strong! Thank you to all of the teams that came out to Colorado for our Mile High Invitational! We had an awesome time hosting all of you! Hey Buffs! 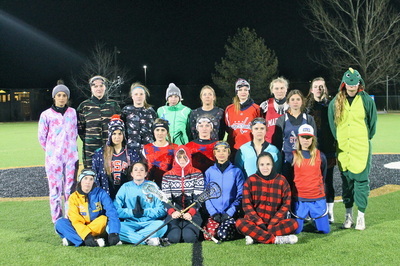 Winter break was fun, but it's time to get back in the groove for lacrosse season! We will be having an informational meeting on Wednesday, January 16th at 7:30 in the medium meeting room above the ice rink at the CU Rec Center. Sko Buffs! First Team Hike of the Fall Ball Season! Welcome back Buffs! To kick off the season we will be having an informational meeting on Wednesday, August 29th at 6:30 in the meeting room above the ice rink at the CU Rec Center. Can't wait to see everyone there! The Buffs end the 2018 season placing 12th at Nationals! Congratulations to our Seniors: Alaina, Leah, Jess and Alyssa! The Buffs are back! We will be having a spring season informational meeting on Thursday, January 18th in the medium meeting room at the rec. center at 7:30. We are excited to see everyone there! With the Buffs approaching the halfway mark of their season, focus is turning towards Mile High. 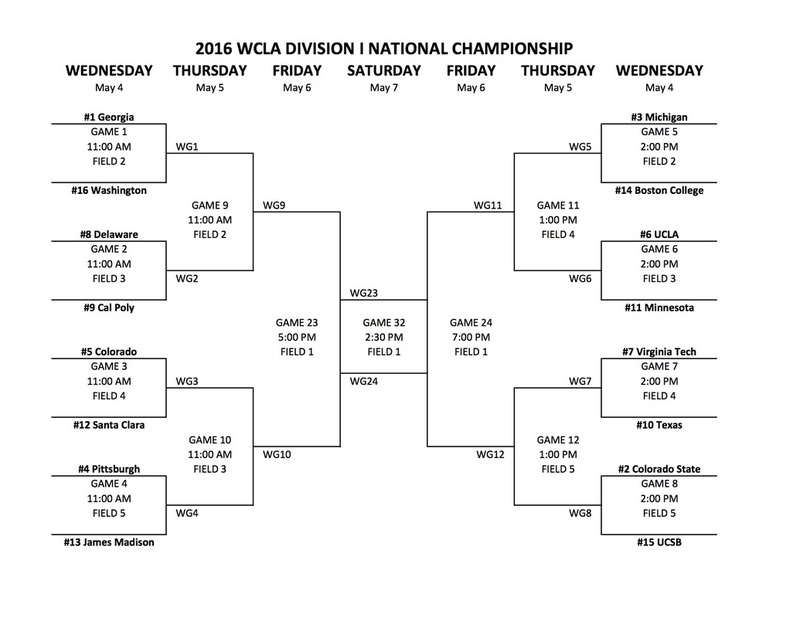 5 of the top 10 WCLA teams will be in attendance on the Buffs home turf. 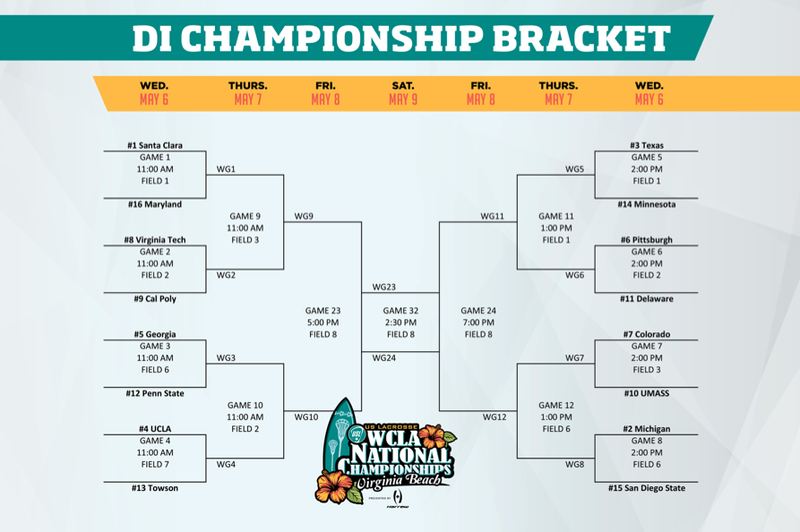 Mile High is always a highly regarded tournament, but with the opponents playing this year there is even more opportunity for some exciting games and movement in national rankings. The Buffs have one more game this Friday against Johnson and Wales before hosting the teams in Boulder. Coming off of a 3 strong game win streak the Buffs couldn't be more motivated going into these coming games. After a few unfortunate cancellations in Santa Barbara, CU is thrilled to be able to show the development of their team. We are excited to see our fans in Boulder! Stay updated on our games by following our twitter @CUWomensClubLax ! As the buffs take the field for the first week of practice, things are looking bright! With 6 players returning from study abroad and 9 new freshman from the fall it is amazing to see how fast the team is clicking. The buffs have never started stronger. 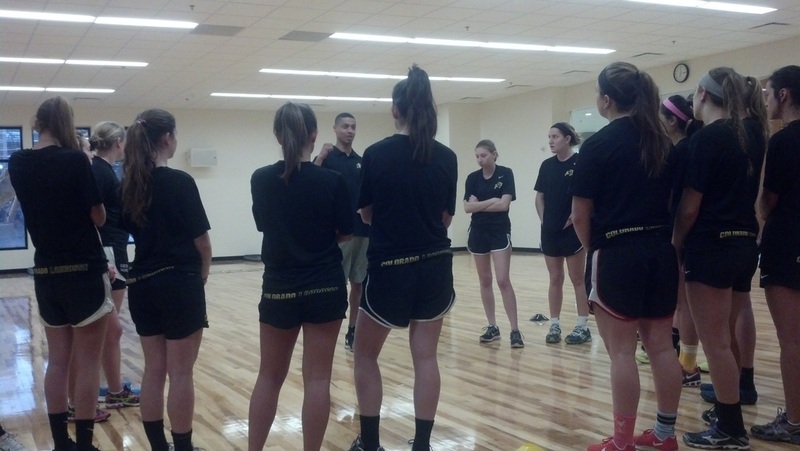 Their first tournament is rapidly approaches, and the buffs take the field every night in preparation. 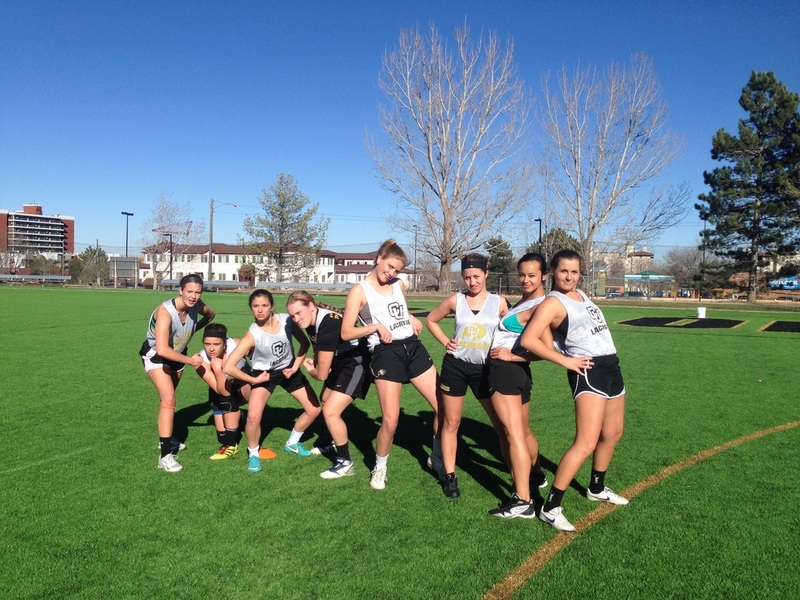 Catch them in their first game at the University of Denver on February 12th. The Colorado Buffaloes are going to be a team to watch out for this year! 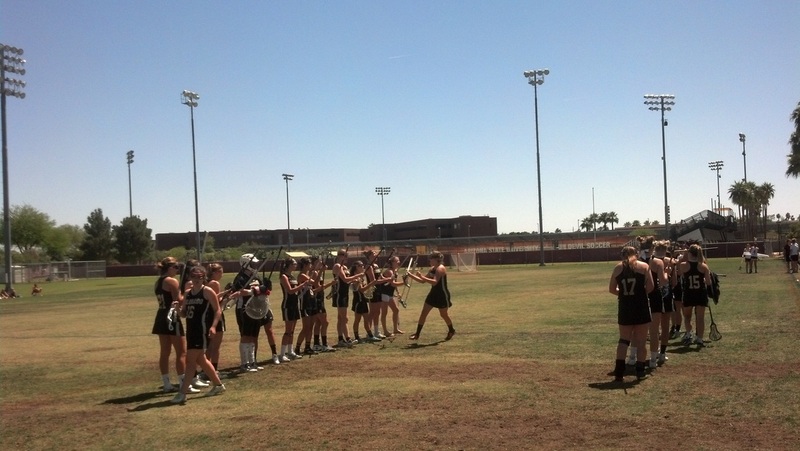 Your lady buffs are back! 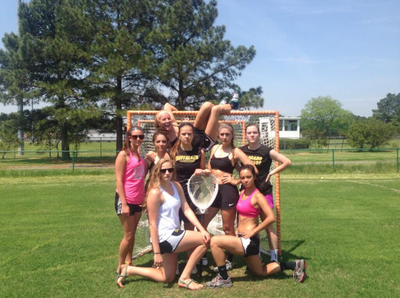 With a 3rd place finish at nationals, things are only looking up for lacrosse women! To all the new freshman out there looking to get involved with an amazing, spunky, and unforgettable team, Women's Club Lacrosse is your place. 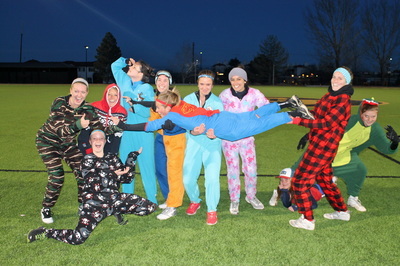 No doubt you will love the group of girls that are constantly making you laugh and having a good time, while simultaneously taking down the competition on the field! Anyone interested in joining there is an information meeting on Thursday, August 25th, at 8 pm. We are meeting in the large meeting room overlooking the ice rink inside the CU Boulder Recenter. If you need help finding it don't be afraid to ask the front desk. We look forward to meeting all of you that share our enjoyment with lacrosse. The Buffs end their season coming in 3rd place at the National Tournament. With their first game against Santa Clara, the buffs were able to win and advance into the next round where they defeated Pittsburgh during a rainy game. In the semi-finals, the buffs went up against the 1st ranked team Georgia. Unfortunately, the buffs lost to the national champions. In a fight for 3rd place, the buffs came out victorious against CSU. During the tournament, athletes were recognized for their hard work throughout the whole season. Makala Udoni was awarded Second Team All-American and Hannah Hilden-Reid was awarded First Team All-American. 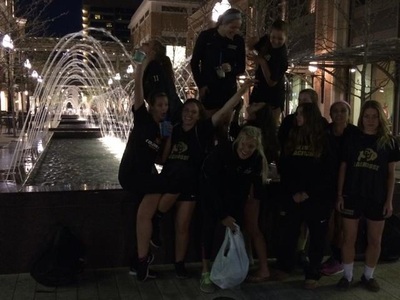 The buffs also had three players who made the Tournament Team: Bailey Boese, Sally Joyce, and Jessica Tobey. This is not just a team but also a family. We are sad to see four of our teammates go. Our seniors, Bailey Boese, Hannah Hilden-Reid, Morgan McCurdy, and Samantha Medlyn, have put countless hours into this program and we are all sad to see them graduate. We thank them for everything they have done for this program because without them it would not be what it is today. We wish them luck for the future and hope they will return continue supporting this team. The buffs made it to nationals! 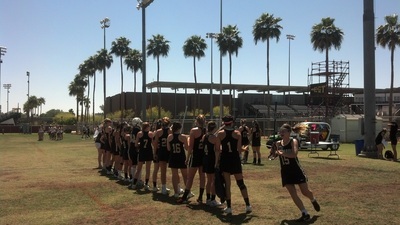 With a win against CSU and Air Force, the buffs acquired a first place seed into the RMWLL championship. On April 16th a hard fought game against CSU the buffs came in second in the tournament. However, they were still able to secure a 5th ranked spot at national which is being help in Winston-Salem, NC. 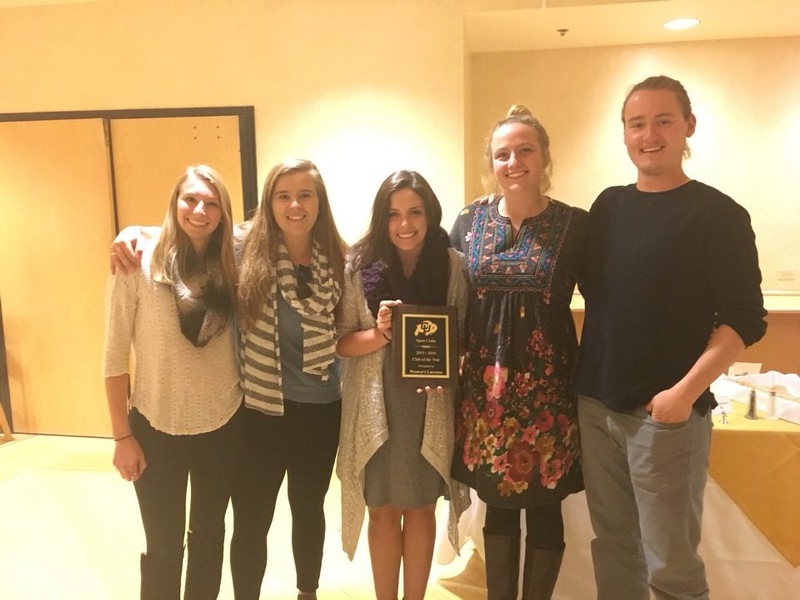 While waiting for nationals to come, the team was awarded Club of the Year by our club sports department. Thank you to all the the captains and coaches for prevailing through all of the ups and downs. With a rough start to the tournament, including a snow storm and numerous flight cancellations, four teams were able to come to Boulder to participate in a mini tournament: CU, CSU, Georgia, and Texas. The buffs were able to play Georgia and Texas. On Friday March 25 the buffs played a fierce game against Georgia. Georgia was in the lead the first half but the buffs fought hard and dominated the second half. At the end of regulation time the game was tied. A sudden death overtime was played. 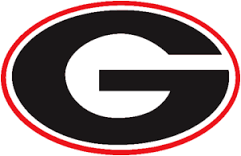 Georgia scored the winning goal during the second half of overtime to win the game. 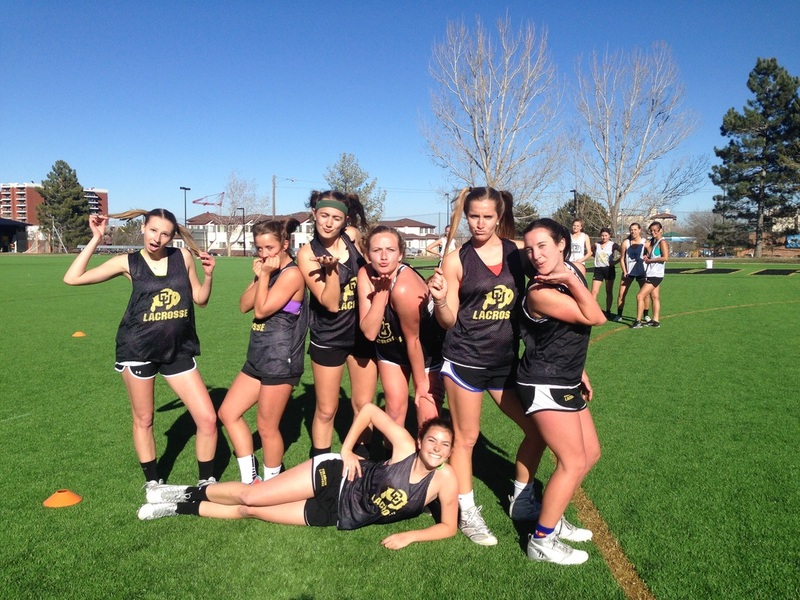 To wrap up the mini tournament the buffs played Texas on Sunday March 27. This fast pace game was tied during half but in the second half the buffs increased their lead and defeated Texas. Thank you to all of the teams who were able to come and play in the tournament and thank you to all the fans who were able to come and support their team! Hope to see all of you next year! 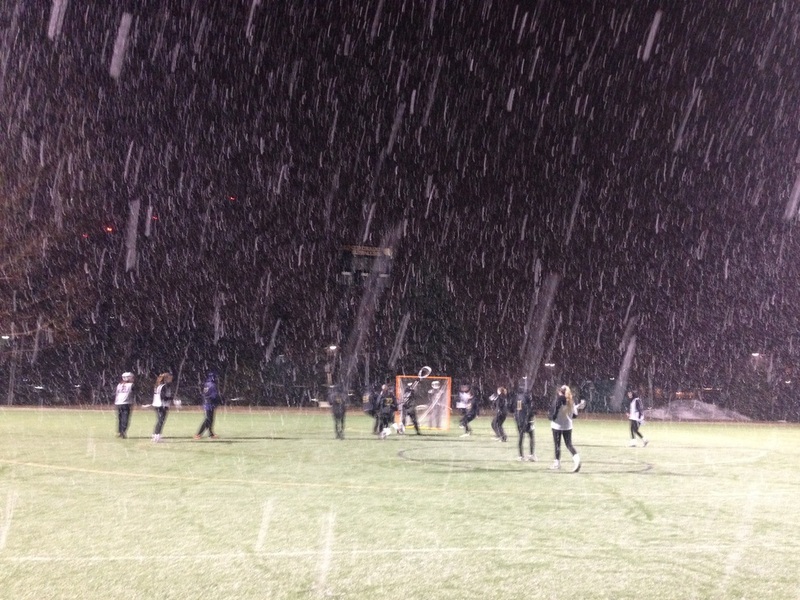 Due to possible snow conditions, some games have been moved to CU's Athletic Bubble. Times have also changed due to the new location. Please look at the 2016 MHI Invitational page to see game changes. Teams please look at your new welcome packet for directions to the Athletic Bubble and Kittredge field. If you're interesting in pre-ordering our MHI apparel for a discounted price please view our "2016 MHI Pre- Order Apparel" page by clicking here! On Thursday February 11 the Buffs traveled to Santa Barbra, California for the Santa Barbra Shootout. On Friday February 12 the buffs played Pittsburgh and came out with a 15-14 win after a hard fought game that went into overtime. That same day the Buffs played University of San Diego and won with a score of 10-9. 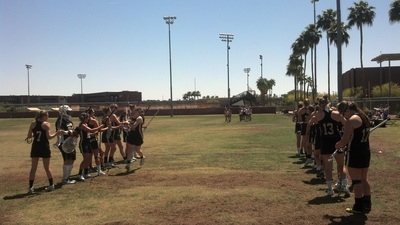 On Saturday February 13 the Buffs played a very early 8am game against the University of Minnesota. 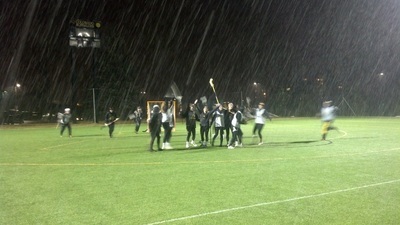 The game was extremely close but Minnesota scored the winning goal in overtime, 12-13. The Buffs last game was on Sunday February 14 against Western Washington. 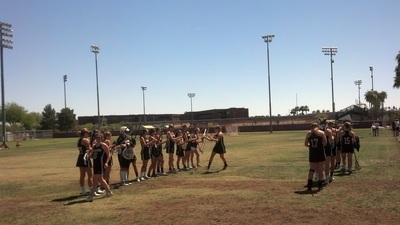 In this high energy game, the Buffs ended their tournament with a 13-7 win. This weekend also gave the Buffs an opportunity to play high competitive games and to enjoy the warm weather. The Buffs had a BBQ at the beach which allowed the team to become closer and gave parents an opportunity to get to know the girls. We want to say thank you to all the parents, friends, and other supporters for making the journey to come cheer on Buff lacrosse! Amber Lister will make her debut as the Buffs Head Coach in January, 2016. An alumni and former 2-Year Captain and President of the CU Club program, she brings passion and a sense of pride to the Buffs this year. Amber grew up in Aurora, Colorado, where she was a 4-year varsity letter member at Smoky Hill High School in both field hockey and lacrosse, captaining both teams her senior year. She received All-State Honorable Mention Honors as a freshman lacrosse player and was a 3-time First Team All-State selection. She also garnered First Team All-State honors twice in field hockey. She was a 4-time All-League selection in both sports. She was named the Rocky Mountain News Athlete of the Week and the Smoky Hill High School Female Athlete of the Year. 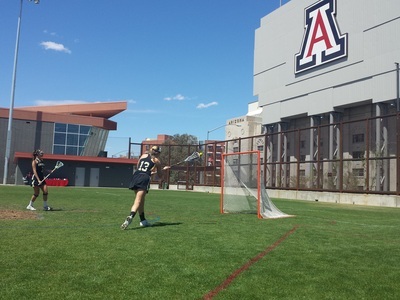 Amber played one year of Division 1 Lacrosse at Saint Mary's College of California under Head Coach Lauren Uhr. Prior to an ankle injury, she started every game as a freshman and tallied 11 goals, 4 assists, 10 ground balls and 4 draw controls in 10 games. Returning to Colorado her sophomore year, she joined the University of Colorado Women's Club Team, where she started every game over her 3 year career and led the Buffs to three consecutive Nationals appearances (3rd, 2nd and 3rd, respectively). Amber was twice recognized as a US Lacrosse 2nd Team All-American and garnered two All-National Tournament Team Selections in 2009 and 2010. In 2009 after playing in the National Championship game, she received the National Tournament Offensive MVP trophy. 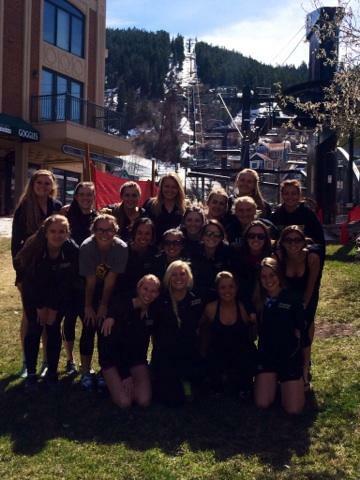 The buffs ended their fall ball season with a win against Airforce and two wins while playing in the Regis Playday. 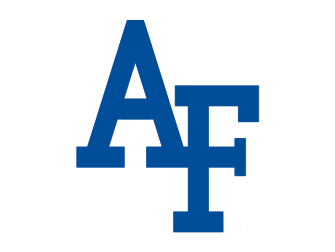 On Friday, October 23 the buffs went 16-8 against Airforce, a new member in the RMWLL. 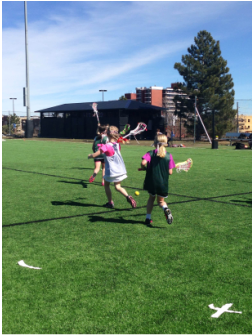 This was a fast moving games which allowed all the the buffs players to log in many minutes on the field, including one of our goalies Emily Buzek. 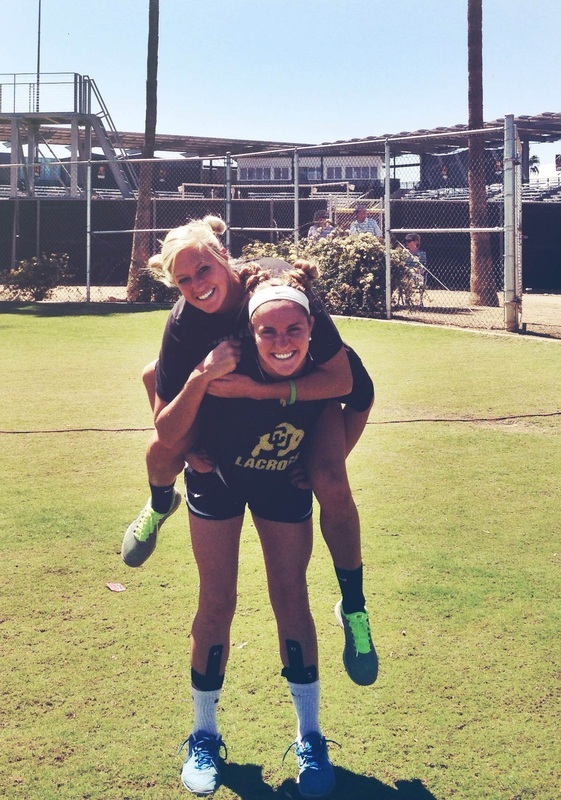 After playing the first half in the goal, she was able to step on the field as a field player giving the buffs a goal! Congrats Emily on your first goal. The game ball goes to Samantha Medlyn for her constant hustle on the field and her leadership. Our last day of fall ball, Saturday October 24, consisted of two games during our Regis playday at Regis University. 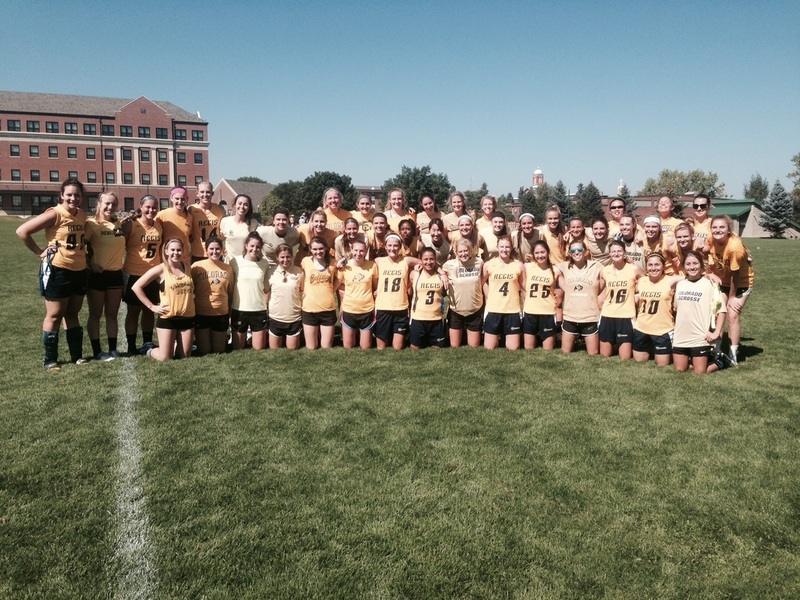 Their first game was against Johnson and Wales University (JWU). 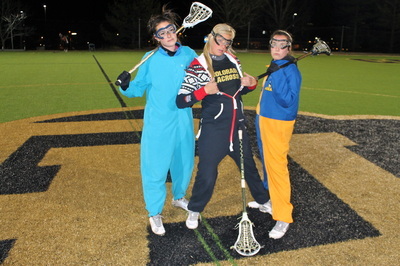 This was the buffs first time playing JWU because this is the first year JWU had a women's lacrosse team. The buffs won the game 13-4. We can't wait to see what the future holds for this new program. The buffs second game was against DU. The buffs fought hard in this game and came out victorious with a 11-5 win. Mallory Perschke, one of our freshman, confidently took up the role as a midfielder when the coaches asked her to it. She fought for the draw and continued her hustle on both attack and defense which resulted in her receiving the game ball for the tournament. This has been an amazing fall ball for the buffs! Thank you to all of those who have come and supported the team! Please stay in touch for more information about our upcoming spring season and our tournament which we will be hosting on March 25-27, 2016. (On Friday, October 16 the Buffs played against University of N. Colorado. With a win of 19-10, 9 CU players scored during this game including Emma Mahoney (2), Hannah Hilden-Reid(3), Tory Salmon (3), Makala Udoni (4), Jessica Tobey, and Abby Phelan. Some of the buffs new players contributed to the score including Tori Bailey, Ashley Pretorius, and Allie Coy (3).Along with goals, Ashley Pretorius (2), Emma Mahoney (2), Hannah Hilden-Reid (2), Samantha Medlyn, and Tory Salmon (2) collected assists during the game. This game gave the team a perfect opportunity to work on plays and play together. The game ball was given to Jessica Tobey because of her consistency and hard-work on the draw. On Sunday, October 18 the Buffs played against Colorado State University. The rams pulled out early in the game but the buffs were able to quickly score some points to reduce the gap. However, the buffs lost 12-15 during the hard fought game. 10 different players contributed goals for the team: Tori Bailey, Sydney Norman, Ashley Pretorius, Allie Coy (2), Emma Mahoney (2), Jessica Tobey, Hannah Hilden-Reid, Madison Merrill, Abby Phelan, and Mallory Perschke. Hannah Hilden-Reid (2) and Makala Udoni also contributed with assists. 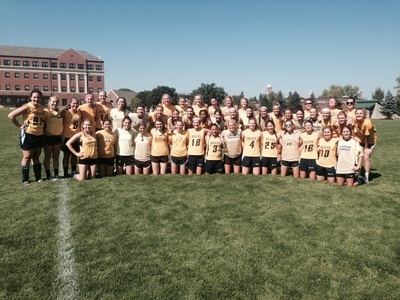 ​On Friday the Buffs welcomed back many of their alumni to play in their Alumni Game! We couldn't have asked for a better night to have this game. Due to the large amounts of girls, current players were switched in and out the alumni team which resulted in a very high competitive game! At the end of the game the alumni reigned victorious with a 13 to 5 win. Thank you to all of the alumni who came out and played! We hope to see you next year! 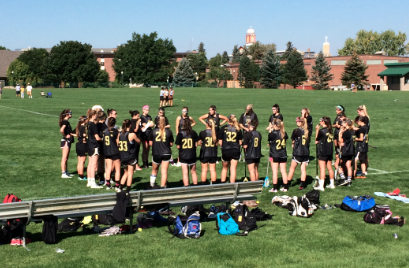 Interested in being part of the CU Women's Club Lacrosse team? To kick off the 2015-2016 season we will be having an informational meeting on Thursday, August 27th from 7:45- 8:45pm in the Multipurpose Room in the Rec Center. The meeting will be a great opportunity to meet the coaching staff, captains, and future teammates. Information about the upcoming season will be provided and any questions that you may have will be answered. Hope to see you there! Your Buffs leave the National Tournament with an incredible 6th place ranking. 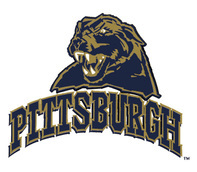 They were able to defeat the previously undefeated University of Massachusetts in the first round, fell to Michigan in the second round (the later National Champs), defeated Pittsburgh, then finished their tournament with a hard fought loss to Georgia. The tournament also brought a lot of individual recognition to many of our Buffs. We celebrate Meaghan Stertzer, Sophie Mercuris, and Elizabeth Tandler for their All-American Second Team Awards and Hannah Hilden-Reid on her All-American First Team Award. Additionally, congratulations to Sophie Mercuris on making the All-Tournament Team! While we reflect on an amazing season we must say goodbye to some unforgettable players and people, seniors Meaghan Stertzer, Torey Cole, and Elizabeth Tandler, all graduated this year leaving an incredible legacy behind them. We thank them for their many years as members of the CU Women's Club Lacrosse program and wish them well in their future endeavors! Sadly, we will also being saying goodbye to one of our most dedicated coaches in the history of the program. Sara Tanabe has committed an immeasurable amount of time, energy, and soul into this team as both a player and a coach. Much of our success can be attributed to her efforts. We thank Sara for getting the program to where it is now and hope to have her return in the future. This past weekend the Buffalos headed off to Lyons to work with Boulder County Open Space to do some serious forest restoration. The girls spent the day working at cut and burn sites, aerating the soil and planting native plant species to help return the forest to a healthy state. It required a lot of hard work but the ladies had a great time doing it. Your Buffs loved giving back to the community! It looks like your Buffs officially received their invitation to the National Tournament! This was after an exhilarating win against Colorado State University during the RMWLL Championship game. It is the first time in our program’s history that CU has won the League Championship! This win comes with a shiny new trophy but more importantly with an automatic bid to Nationals! We are absolutely thrilled to have secured this spot in the tournament and to have the opportunity to prove ourselves in Virginia Beach. Please check out our Nationals Fundraising Project on Community Funded! As an almost completely participant-funded program we need your help to get us to the National Tournament this spring. Please donate and share this link to help us achieve our goal! Thank you for our continued support! Follow this link for more: http://www.colorado.edu/crowdfunding/?cfpage=project&project_id=11142. If you're interesting in viewing the results of the games from this weekend please go to our "2015 MHI Invitational" tab or follow us on Twitter at CUWomensClubLax. If you're interesting in pre-ordering our MHI apparel for a discounted price please view our "2015 MHI Pre- Order Apparel" page under the "2015 MHI Invitational" tab in the menu bar! 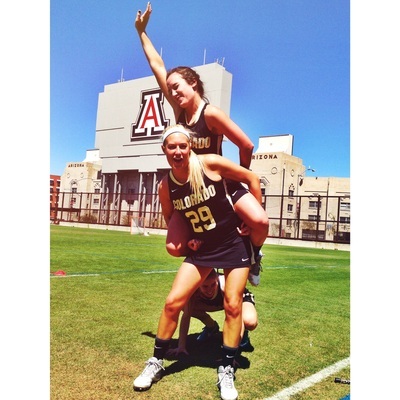 This past weekend, the Buffs traveled to Phoenix, Arizona tackling first Arizona State University on Friday, then University of California San Diego and Brigham Young University on Saturday. 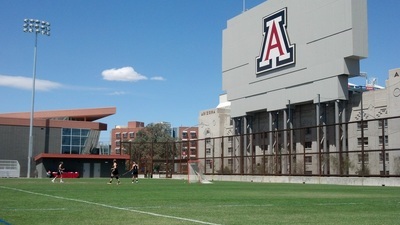 The team flew to Phoenix, AZ Thursday, March 5th and prepared for their 3 pm game the following day. 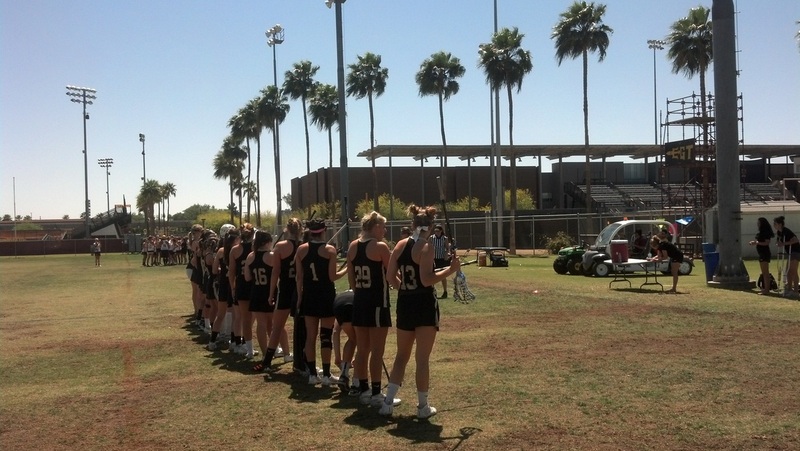 On Friday, a breezy 80 degree day, the Buffs took control early against ASU, scoring 12 goals in the first half, only to be answered with a single goal by ASU. Eight buffs contributed to the 17 points including Nicole Morris, Hannah Hilden-Reid, Olivia Smith, Meaghan Stertzer, Brielle Vinther, Morgan McCurdy, and Elizabeth Tandler. The game ball – an honor voted on by the team by nominating players for their overall contribution to a win – was unanimously voted to go to Olivia Smith for her outstanding performance. Buffs faced UCSD at 9:30 am. They showed up to play with a fury, scoring 13 unanswered goals in the first half. The game ended with a final score of 17-2 for the buffs, another solid win! Ten people contributed to goals scored in the game including Jessica Tobey, Hannah Hilden-Reid, Olivia Smith, Elizabeth Tandler, Meaghan Stertzer, Makala Udoni, Emma Mahoney, Torey Cole, Morgan McCurdy, and Brielle Vinther. Jessica Tobey and Morgan McCurdy heavily contributed with their steady winning of the draws, additionally our goalie, Emily Buzek, was unstoppable with a numbers key saves. The game ball was awarded to Leah Keen for her incredible hustle on defense and all over the field. After a couple hours the team returned to the field to face BYU, a historically huge rivalry. With three early goals by CU it appeared as if the game was heading towards a blow out, but BYU responded with a fire giving the buffs a run for their money. At half BYU was up 8 to 7, much of their success attributed to being able to win the draw. The second half the Buffs really turned it on, completely shutting out BYU scoring 11 unanswered goals. Emily Buzek was able to shut the BYU offense completely out, conceding zero goals in the second half. 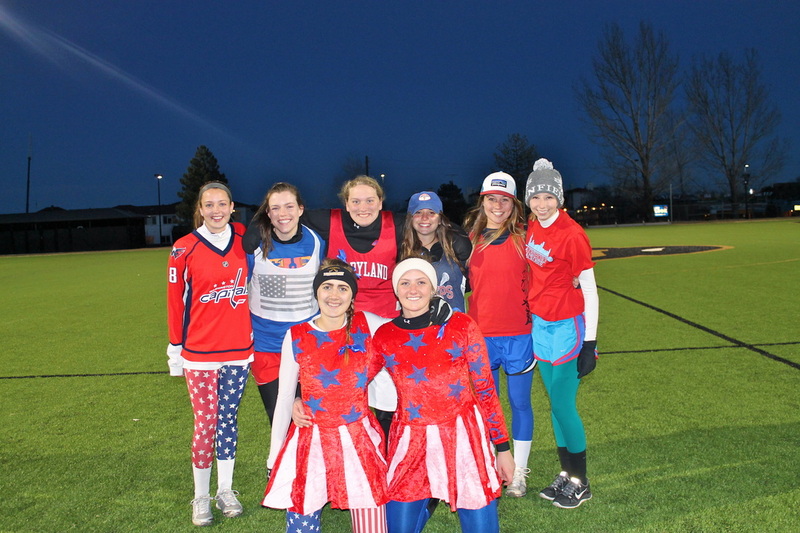 Eight people contributed to goals in this game including Olivia Smith, Hannah Hilden-Reid, Elizabeth Tandler, Abby Phalen, Meaghan Stertzer, Torey Cole, Olivia Smith, and Jessica Tobey. Game ball again was awarded to the deserving, Olivia Smith who had an amazing weekend. The Buffs left Kitt Field this past Saturday with another win, beating School of Mines 15-6. They were able to rack up the score and limit their opponent to 6 goals. A great win for the ladies that will carry them into their big weekend in Arizona! Way to go Buffalos! One of our own Buffs, Alaina Campbell, put together this amazing montage from Santa Barbara. Check it out! Your buffs return from California with a 3-1 record, defeating Cal Poly (10-8) , University of California Santa Barbara (13-12), and University of San Diego (19-13). The buffs were only beaten by UCLA with an incredibly close game (7-10) after the Bruins were able to successfully stall the last few minutes of play. All teams faced by the buffs showed incredible talent and passion. This weekend shows that the Buffalos are not a team to be underestimated but rather to be feared. 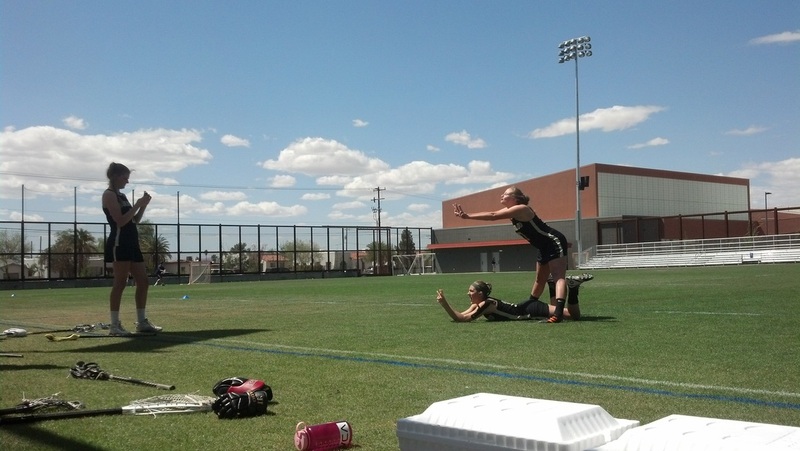 The buffs continue to work hard to prepare for their upcoming game against School of Mines. The CU women's club lacrosse team will be heading to California this weekend to face their first competition of the season. 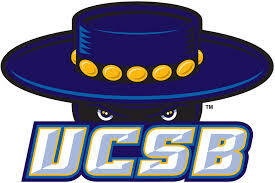 They will be playing Cal Poly, UCLA, UCSB, and San Diego, all of which will be fierce competitors. For game times and results please view our "Schedule" tab. 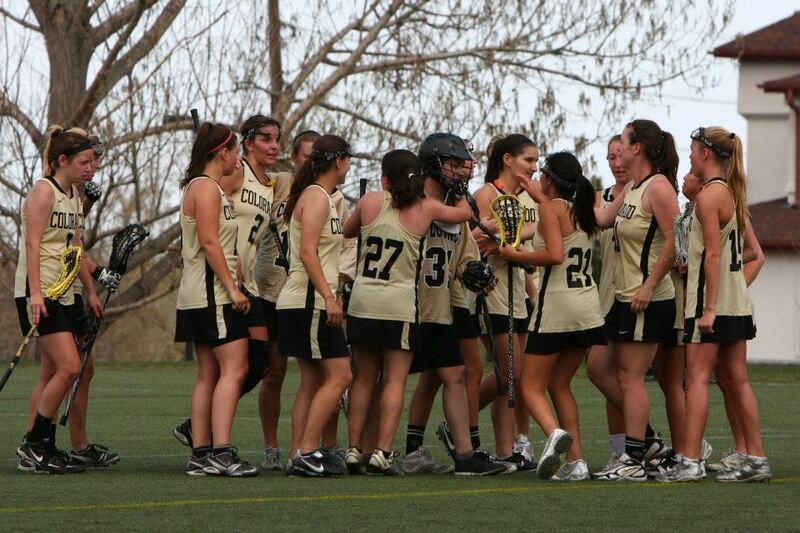 For play-by-play game updates please follow us on twitter @ cuwomensclublax . 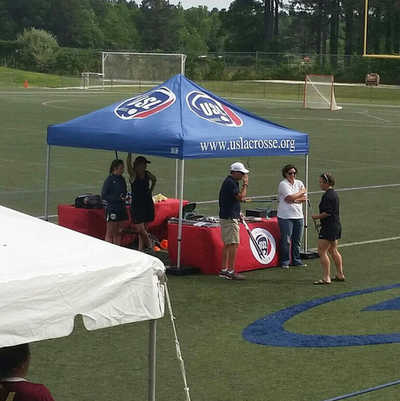 If you are interested in seeing photos from the tournament please follow us on Instagram @ cuwomensclublax. Game overviews will be posted here following games. Go Buffs! Check out the "2015 MHI Invitational" tab to see the updated schedule. Game locations are pending. Coach Duvall has gained a lot of experience over the years playing, coaching, and officiating women’s lacrosse at the various levels. Duvall started the NCAA DII women’s lacrosse program at Rockhurst University. Before coaching at Rockhurst University, Bri was the assistant coach at St. Teresa’s Academy High School in a Kansas City for 3 years. 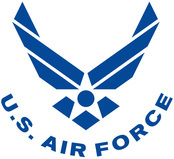 They were also the first program of their kind in the Kansas City area. Prior to moving to Kansas City in 2010, Bri attended Virginia Tech for her undergraduate degree, a Bachelor of Science in Design. She competed with both their varsity program and their club program, but spent most of her time with the club team. She served as a captain and a player coach for her National Championship team in 2009. Before attending Virginia Tech, she attended a small Division III school in central Pennsylvania, Elizabethtown College, and competed under Head Coach, Mike Faith, during her freshman year. Bri Duvall grew up in Baltimore County, MD where she attended Hereford High School (2005 grad). She is newly married and has two dogs. In May, she will pursue a second career in Nursing from Regis University. It appears that the Buffs were up to the challenge this past weekend facing NCAA Division 2, Regis University. Although they suffered a loss the Buffs were pleased by their performance, displaying some amazing talent, hustle, and fortitude. We are thrilled to announce that the first fall ball practice of the season was a tremendous success! It is apparent that we have an amazing group of girls this year, all having incredible talent and skill. We are looking forward to watching the team grow and achieve immeasurable success. 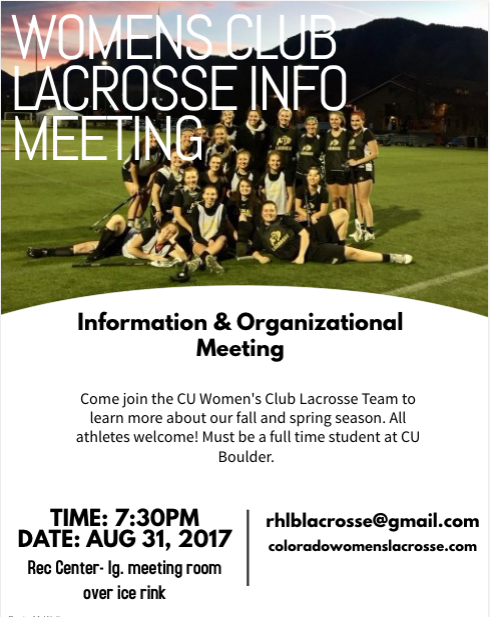 Interested in being part of the CU Women's Club Lacrosse team? To kick off the 2014-2015 season we will be having an informational meeting on Thursday, August 28th from 5-6 pm in Eaton Humanities 125. The meeting will be a great opportunity to meet the coaching staff, captains, and future teammates. Information about the upcoming season will be provided and any questions that you may have will be answered. Hope to see you there! 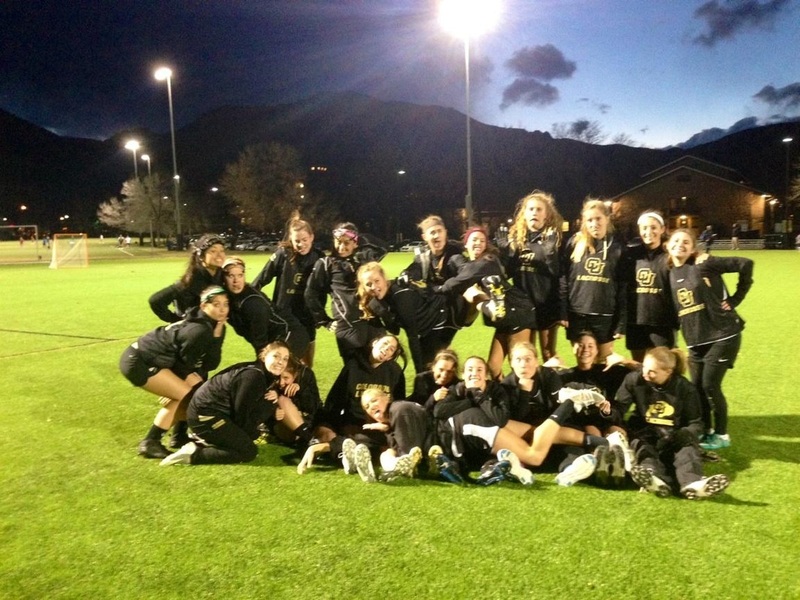 When we left off, your Buffs were headed into the RMWLL Conference Championships in Salt Lake City as the #1 seed. Upon arriving to Salt Lake City and realizing we had to wait for our hotel rooms, we decided to take a trip up into the beautiful mountains to have lunch and spent time in Park City. Here are some pictures from that adventure. 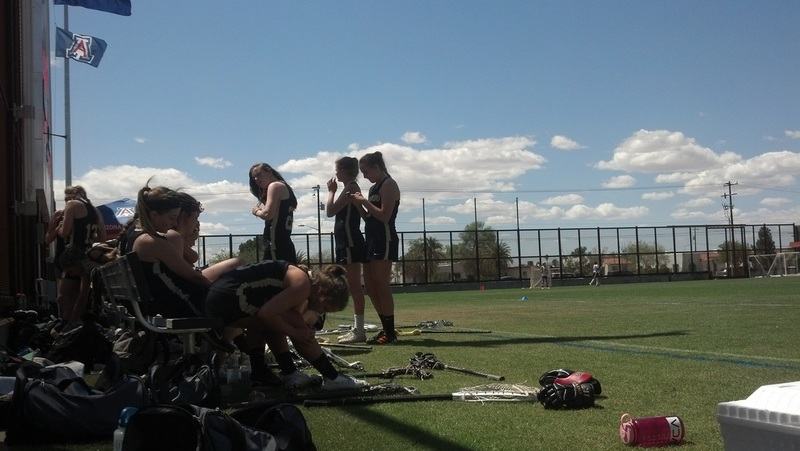 Unfortunately, in the first game the Buffs were upset by the #4 seeded Westminster Griffins 15-8. Due to this loss, the Buffs now had to wait to see if their season-long play was considered good enough to receive an at-large bid to Nationals. Luckily, your Buffs were given one more shot and were headed to Nationals in Virginia Beach as a #11 seed and pitted against the #6 seed Santa Clara. Each year at Nationals there is a banquet to honor players who have done exceedingly well during season play. This year, three of our very own were recognized as Second Team All-Americans: sophomore Hannah Hilden-Reid and freshmen Val Daniels and Sophie Mercuris! Game day was approaching and excitement was high. With the championship bracket being single elimination, a win was imperative to move forward on the road to the Championships. Your Buffs fought hard, ultimately falling short by just one goal. 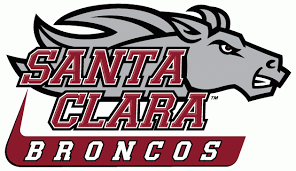 The final score was 12-11, with the Santa Clara Broncos moving forward into the Elite Eight round. There were many highlights in those final weeks, but I would like to take a moment to recognize Hannah Hilden-Reid and Bailey Boese. Due to an injury that worsened an already broken hand during the Santa Clara game, our goalie Val Daniels could not finish out the Consolation Bracket games with our team. That night, we held a team meeting with the girls and asked if anyone would be willing to sacrifice their field spot for the remainder of the season and step in goal so that our team wouldn’t have to forfeit the next three games. Many girls stepped up to the plate. In fact, we were blown away by the fearlessness and generosity of our players. After some casual “try-outs” at a nearby Wesleyan field, we determined that Hannah Hilden-Reid and Bailey Boese would split time in goal. Stepping up to play was enough. However, these two allowed our team to remain competitive. 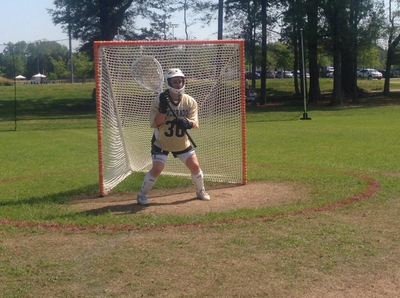 They put everything they had into playing goalie, having only seen one practice and a handful of shots. As a final sweet moment to the tournament, Hannah was awarded All-Tournament team honors! The end of the season always comes with some sad goodbyes of our beloved seniors, or in our case, senior. 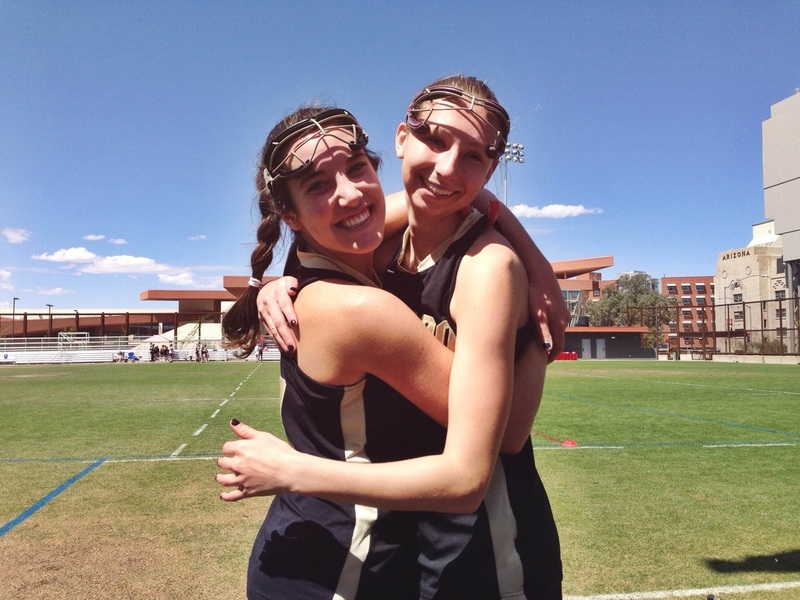 Remy “Red” Denner was a committed Buff for four years up until the very end, missing her own graduation to compete at Nationals. She was not only a great Captain but also a crucial asset to our defense - she will be missed. We wish her lots of luck at Georgetown as she begins her next adventure: law school! With the summer winding down, next year’s season is on everyone’s mind. Jess Tomlinson and I (Emily Gill) have decided to step down from the coaching staff to focus on nursing and graduate school, respectively. We would like to sincerely thank the players and the parents for the wonderful opportunity and all the great memories. We wish you the best of luck with this next season and will be supporting you along the way. GO BUFFS! 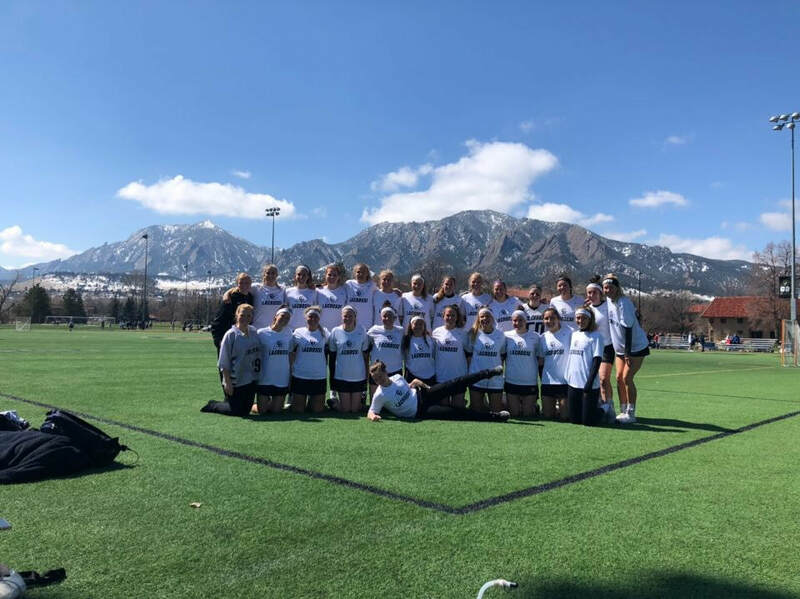 This weekend, our buffs completed their regular season conference games versus Colorado State University on Thursday April 10th and Westminster College on Friday April 11th. 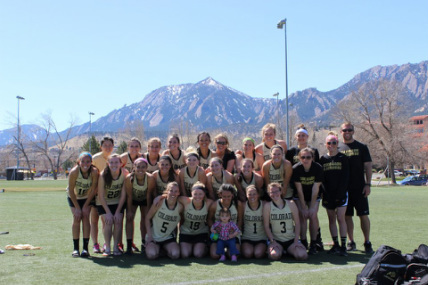 With back-to-back wins, the Buffs have secured the #1 seed heading into the Rocky Mountain Women’s Lacrosse League championship this upcoming weekend at the University of Utah in Salt Lake City, UT. 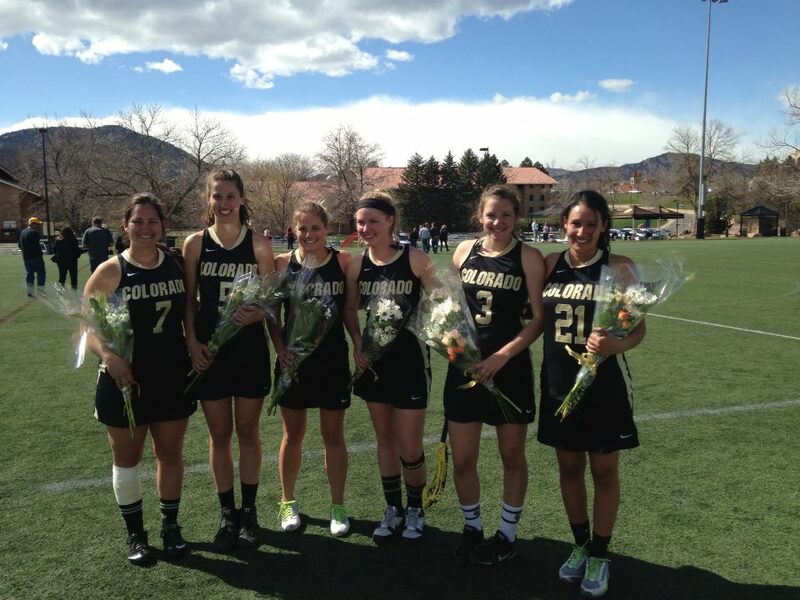 On Thursday, the Buffs played long-time rival CSU at home on Kittredge Field in beautiful spring weather. It took the Buffs a little while to adjust to the high-pressure defense of Rams, however huge plays from Nicole Morris, Torey Cole, Sophie Mercuris and Val Daniels held the Buffs in the game and shifted the momentum in our favor. In fact, Nicole Morris was awarded the game ball for her huge goals in the second half that helped CU climb out of a small deficit and take the lead. Points were tallied by Nicole Morris (3 G; 1 A; 2 FP), Torey Cole (3 G; 1 A; 2 GB), Mikaela Curaza (1 G), Makala Udoni (1 G; 4 DC; 2 GB), and Hannah Hilden-Reid (1 G; 1 A; 1 DC). Big shout out to our defense for holding CSU in crucial moments of the game, especially to Sophie Mercuris (3 GB; 2 CTO), Morgan McCurdy (1 GB; 1 CTO), and goalie Val Daniels for 7 huge saves. 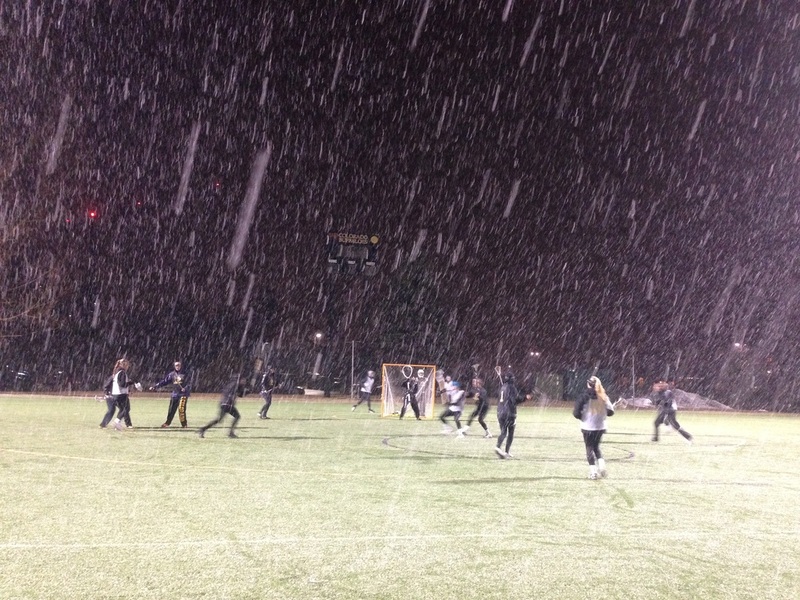 On Friday, following the boys victory on home turf against Westminster College, our girls set out for the same. The Westminster Griffins came out strong and hung in with out Buffs throughout the first half. In the second, our girls reached a new level of composure, and pulled away for a good 15-8 victory over the Griffins. Sophomore Emily Knutson had a phenomenal game tallying 6 goals, 1 assist, 2 draw controls and 1 groundball. We are so proud of our team for not depending on 1 or 2 girls to score the majority of our goals. Instead, in what has become commonplace for our buffs, goals, assists, draw controls, groundballs, and caused turnovers were issued across the board! A great team win. Not surprisingl, the team vote came to a tie between freshmen Jillian Goulding and Sophie Feffer for their great impact and composure this win. As a special note, this game was our Senior Game - the home game each season that is devoted to honoring the work and commitment our seniors have put into the team. This year, we only have one! So this game was played and won on behalf of our senior, Red Denner. buffs go 3-0 in the desert! 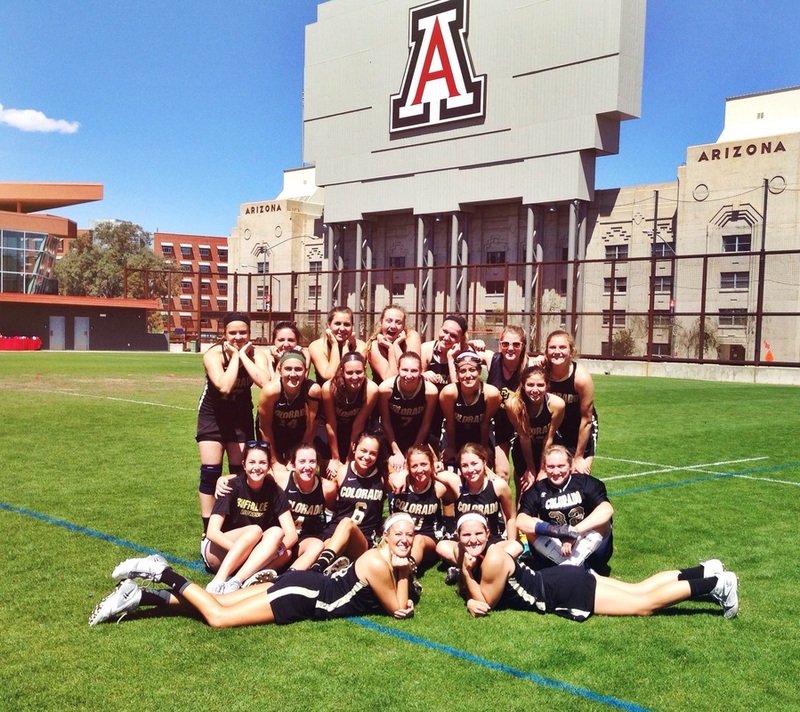 This past weekend, the Buffs travelled to Arizona in an effort to start the tradition of an annual Pac-12 weekend with the University of Arizona, Arizona State University and the University of Southern California. In future years we hope to keep this up and change locations between AZ, CA, and CO. Not knowing much about these teams we were not sure what to expect , but are extremely proud (as usual) of our Buffs for returning to Boulder yesterday 3-0 on the weekend! 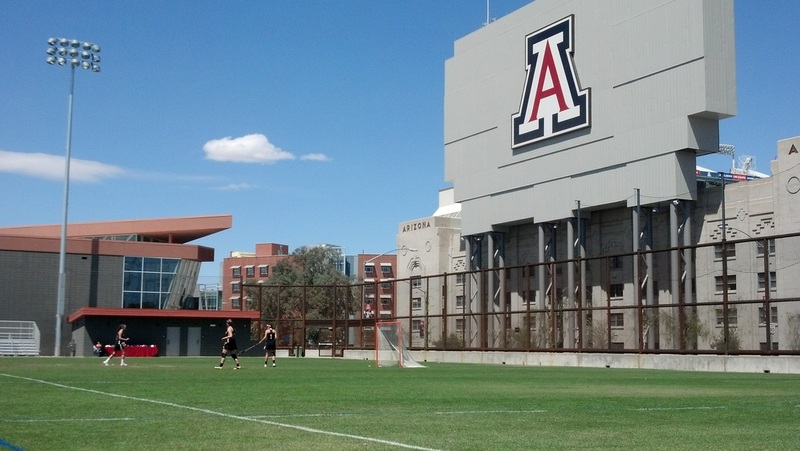 The team travelled to Tucson, AZ Saturday, April 5th to play U. of A and USC back-to-back. The day was certainly a marathon but the girls powered through. 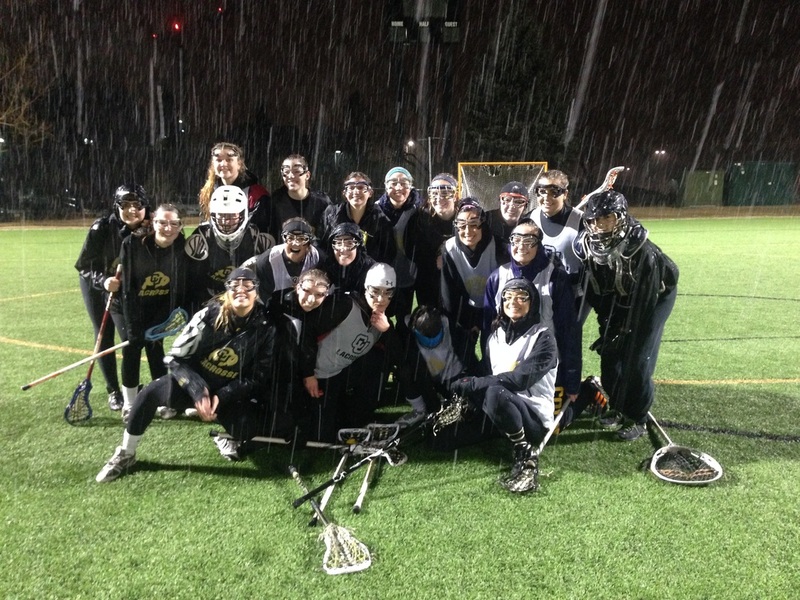 Following a shaky start to U. of A, the team hit their stride ultimately winning 12-7. 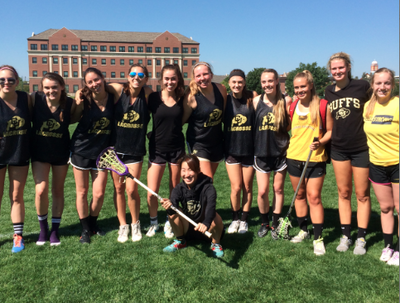 Nine buffs contributed to the twelve points including Madison Merrill (3 G – 1 FP), Hannah Hilden-Reid (2 G), Torey Cole (2 G), Nicole Morris (1 G - FP), ﻿Jillian Goulding﻿ (1 G - FP), Makala Udoni (1 G), Olivia Smith (1 G – 1 FP; 2 A), Mikaela Curaza (1 G), and ﻿Emily Knutson﻿ (2 A). The game ball – an honor voted on by the team by nominating players for their overall contribution to a win – was unanimously voted to go to Val Daniels, our goalie, for her strong performance. About 45-minutes after U. of A (and stuffing their faces with fruit, granola bars, and gatorades provided by the Mercuris’, Gouldings, and Knutsons), the Buffs hit the field again to face USC. After struggling with the draw the first game, we switched things up and tried Morgan McCurdy. Throughout the game, Morgan won 6 draws for the Buffs clean out of the air and facilitated Makala Udoni, Sophie Mercuris, Madison Merrill, Olivia Smith, and Torey Cole in winning countless other draw controls. This incredible contribution earned Morgan the game ball. The Buffs dominated in a 18-8 win over USC with goals from Hannah Hilden-Reid (6 G; 2 A), Torey Cole (3 G), Olivia Smith (2 G; 1 A), Mikaela Curaza (2 G), ﻿Sophie Mercuris﻿ (1 G; 1 A), Makala Udoni (1 G), Emily Knutson (1 G) and Madison Merrill (1 G), caused turn-overs from Sophie Mercuris, Bailey Boese, Sam Medlyn, and Torey Cole, and eight saves from Val Daniels. A real team win! To end this busy day, our Buffs went to a local Mexican restaurant named Mi Nidito recommended by Mr. Feffer and enjoyed some amazing Mexican food before trekking two hours back to Phoenix and packing it in for the night. 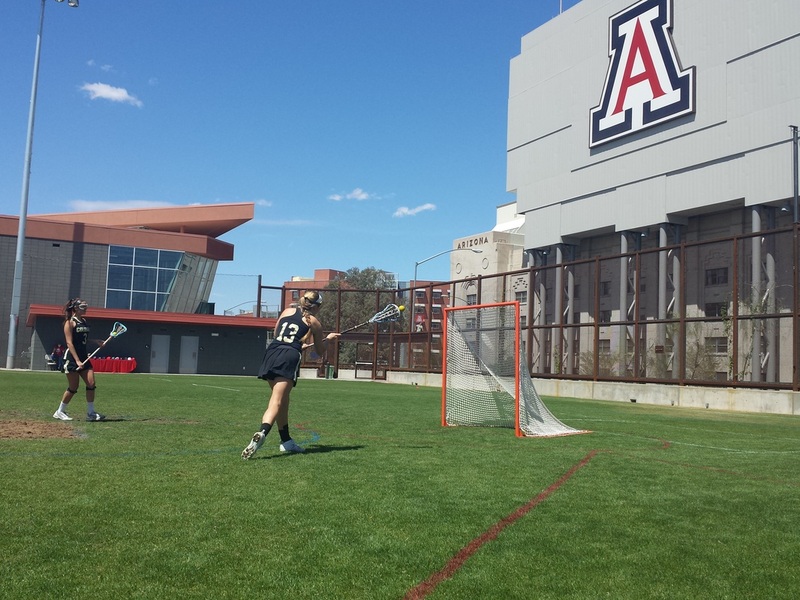 The following day, the Buffs faced ASU in Tempe for one last game before the flight. The sun was out and the heat was intense. A determined ASU team came out and definitely gave the girls a tough fight. The game was very back and forth, and neither lead was ever more than a goal or two. 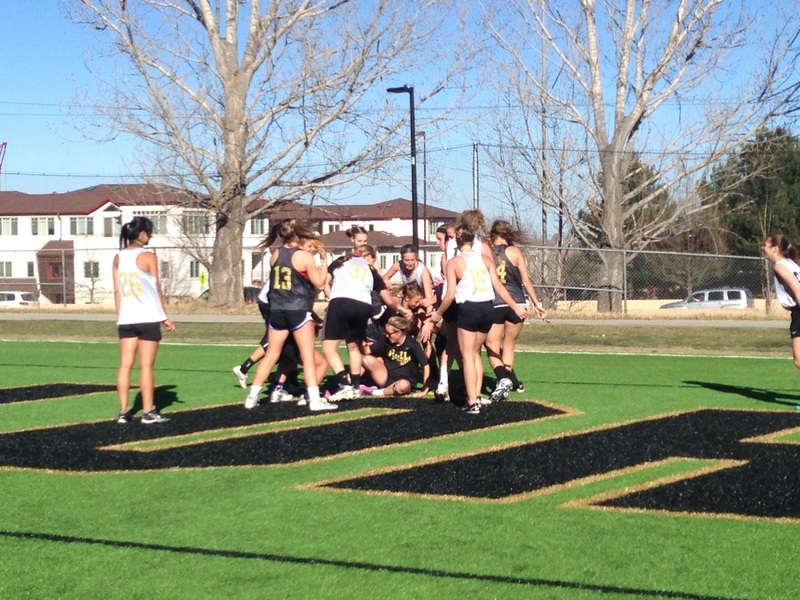 As the clock wound down with about a minute left in the second half, the Buffs were losing by a goal (7-6). Hannah Hilden-Reid took control and tallied one more goal to tie the game and allow the Buffs one more opportunity to leave Tempe with a win. During OT, Makala Udoni assisted in a crucial draw control that gave the Buffs possession and allowed Hannah Hilden-Reid to put away one more, giving the Buffs a one point lead (8-7) over ASU! The Buffs stayed composed throughout the remainder of OT to secure the win. Hannah’s amazing performance made the vote for game ball a no-brainer, however it’s important to note that many of our Buffs contributed to the rally, including Nicole Morris (1 DC), Morgan McCurdy (1 DC), Torey Cole (2 G - 1 FP; 1 A), Remy Denner (1 CT), Sophie Mercuris (2 CT; 3 GB), and Bailey Boese, a defender who scored during the first half on a breakaway and a beautiful shot that was crucial in our one-goal victory. Thank you to all the parents who supported us by either cheering us (in AZ and on twitter!) and supplying us with water, gatorades, and snacks throughout the weekend! And thanks to Meg Stertzer for doing such an awesome job tweeting our games! Early morning set-up for MHI 2014. This past weekend in Boulder, Colorado we got a break from the snow while hosting eight teams from around the country in our 3rd annual Mile High Invitational. Participating schools were Colorado State University, Brigham Young University, Westminster College, University of Georgia, University of Texas, Ohio State University, University of Michigan and UC Davis. The tournament went off without a hitch thanks to all the help from our players, parents and CU Club Sports department! 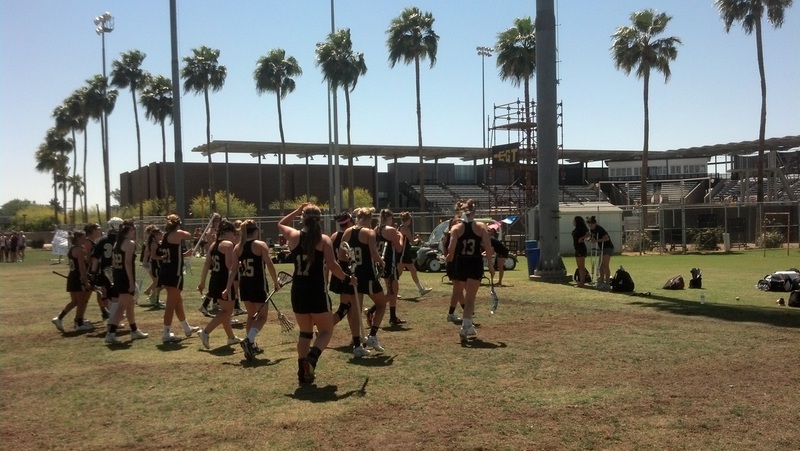 Our buffs started the weekend strong with a dominant 18-7 win against UC Davis on Friday March 28th followed by another strong 14-7 showing versus the University of Texas on Saturday March 29th. Following the University of Texas game, we held an amazing tailgate where players, coaches, parents and siblings were able to meet and attach some faces to names. Thanks to Adrienne and Dave Tomlinson for organizing the tailgate and thank you to all our parents who contributed it making it such a special event! Flatirons during early morning set-up for the 2014 MHI on Kittredge Field. Later that evening the Buffs hit the turf again to play Ohio State University - a team that has really proven themselves in the WCLA this season. While the Buffs struggled to put a full 60 minutes together, they also were faced with three revoked goals and some questionable yellow cards that ultimately contributed to a 15-9 loss. 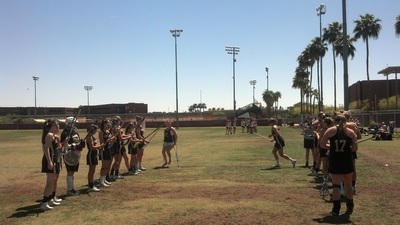 On Sunday, the last day of the tournament, the Buffs faced off against a highly ranked University of Michigan squad. The game was back and forth the entire time as the teams were evenly matched in skill. Ultimately, when the buzzer went off marking the end of regular period play, the Buffs and the Wolverines were tied 8-8. In OT play, Michigan nailed in one last goal. With the Buffs not able to answer, they ultimately fell 9-8 to Michigan in OT. strong win vs unc calls for some handball! 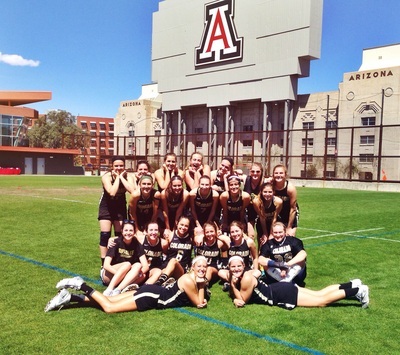 Yesterday the Buffs cruised to a strong 19-0 win against the University of N. Colorado (UNC). It was a team effort, with many of our players tallying points. Hannah Hilden-Reid led the pack with 4 goals and 2 assists. Other points came from Makala Udoni (3 G, 1 A), Meaghan Stertzer (1 G), Sophie Feffer (1 G, 2 A), Madison Merrill (1 G), Brielle Vinther (1 G, 1 A), Olivia Smith (2 A), Mikaela Curaza (2 G), and Torey Cole (1 G, 1 A). Red Denner, Bailey Boese, Lauren Davis and Nicola Maude stepped up big for the defense, only allowing UNC to enter their offensive third 4 times the entire game! This game gave us the opportunity to try out some new players, Sophie Mercuris (1 G, 1 A, 2 CTO), Emily Knutson (1 G, 1 CTO) and Morgan McCurdy (3 G, 1 DC, 2 GB) in midfield positions and we're extremely proud of the way they performed. Specifically, McCurdy received the game ball, voted on by her teammates at the end of the game, for her overall presence on the draw, powerful impact all over the field and a hat-trick on top of it all! Our Buffs put on a great clinic for the first portion of the day. Following lunch, BVGL girls were teamed up in groups of 3 and given one or two Buffs as coaches! Then, each team competed in a series of mini 3v3 games within their age group (U9, U11, or U14). We closed the day with some fun competitions that included Most Accurate Shot and Most Creative Shot. All clinic participants left the day with some CU or BVGL swag and most importantly, some new skills to take with them into their Spring 2014 season with BVGL. Our Buffs had a heartbreaking loss against BYU last night on Kitt when they fell 13-12 in overtime following 60 minutes of tough play in extremely adverse conditions. Despite beautiful weather on Thursday, we had a classic spring Boulder snowstorm that started yesterday morning and didn't let up until after the game was over. 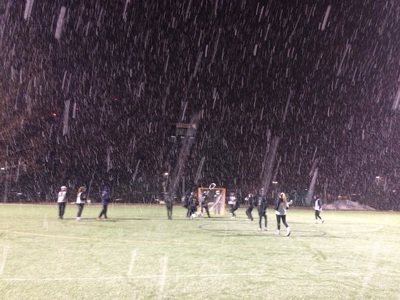 During play, a few inches of snow fell in the turf. Both teams fought hard and unfortunately we fell short. We're proud of our buffs despite this loss and crossing our fingers that we run into BYU again for some serious redemption during our League Tournament in Salt Lake City (April 18-19). For now, we're gearing up to play the University of Northern Colorado this Thursday March 13th at 6:30pm on Kittredge Field (Boulder, CO). We would also like to give a HUGE shout-out to Mr. Morris for running around during the storm last night to clear our lines for us! If it wasn't for him, we'd have no idea where the lines were! Thank you!! 5:00 pm vs. brigham young u.
friday is a double-header vs. byu with our ﻿cu mens﻿ team! immediately following our game on friday, watch the boys play at 7:00 pm. Following a successful trip to sunny California, the buffs slowed down for a week to recoup -- a much deserved break from their hard work. On Friday, we held our inter-team scrimmage. Jess' Superman cape flowing behind her as she fast-breaked down the field. Feff trying to run with a dinosaur tail. Meg getting thrown out of the game by a Banana ref. More pictures from the night! Our CU WCLA women's lacrosse team certainly made coaches, fans and CU proud this weekend at the Santa Barbara Shootout at UCSB. The buffaloes returned to Boulder on Sunday ranked #9 in the country on laxpower, finishing off the weekend with a quality OT win over Cal Poly and a 3-1 record. The weekend started with a Friday morning game against Michigan State. The buffs made a big statement shutting down the Spartans to only four goals all game, ending with a 19-4 win. Leading the charge was Meg Stertzer with 5 goals and 2 assists and Hannah Hilden-Reid with 4 goals and 1 assist. Additionally Olivia Smith (3 goals), Madison Merrill (3 goals), Mikaela Curaza (2 goals; 1 assist), Makala Udoni (1 goal), and Jillian Goulding (1 assist) contributed to the buffs strong offensive statement. Later that day, the buffs were tested facing a strong and determined UCLA at 8:00 pm. Unfortunately, the buffs struggled to win the draw losing some much needed offensive possession time, ultimately falling to UCLA 17-10. We are still proud of the buffs, particularly how much they learned from this game and improved upon the rest of the weekend. Similar to earlier that day, the points were distributed amongst most of the offense/midfield: Makala Udoni, Nicole Morris, Sophie Feffer, Hannah Hilden-Reid, Olivia Smith, Madison Merrill, and Meaghan Stertzer. Shout out to Sophie Mercuris on defense for some crucial ground-balls and caused turnovers during the game. 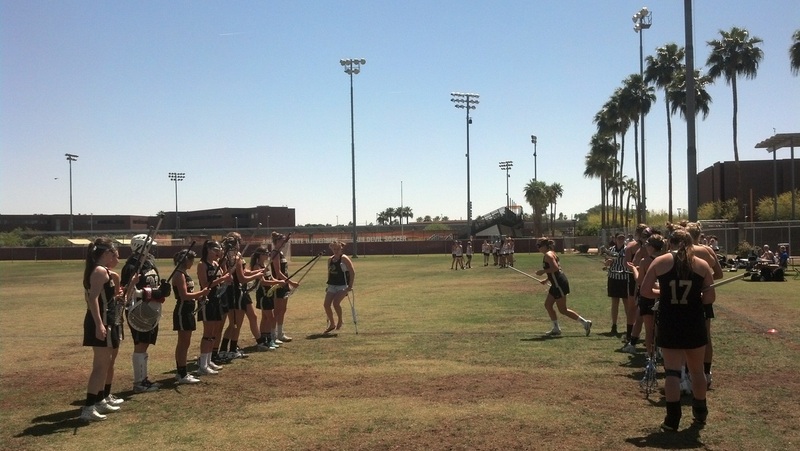 The next morning, the buffs faced Minnesota, a strong team that did very well in the WCLA last season. The game began with a lot of back and forth, with all of Minnesota's goals scored by one player. CU Captain and defenseman Remy Denner stepped up to the plate and shut out this major threat for the remainder of the game (with the help of middie Torey Cole). On the defensive end, sophomores Morgan McCurdy and Bailey Boese tallied between them six groundballs and many important defensive stands. The impact of this was huge, allowing CU's offense to pull ahead and finish strong with an 18-11 win over the Golden Gophers. Shout out to Olivia Smith and Emily Knutson, new players at CU, who made a major statement this game [Olivia - 7 goals and 2 assists; Em - 3 goals and 4 assists]! In addition, Hannah Hilden-Reid, Nicole Morris, Makala Udoni, Meaghan Stertzer, Torey Cole and Madison Merrill contributed to the points. To finish off the weekend, the Buffs faced Cal Poly SLO Sunday morning. The Mustangs were just coming off of a strong 3 goal victory over CSU, reigning national champions. The buffs knew that this game was an opportunity to put together a full 60-minutes and obtain a quality win before returning to Boulder that evening. Additionally, the buffs were channeling a tough loss in the 2013 season to Cal Poly and were pumped for some redemption. Although the buffs struggled with draw control, a strong defensive unit of Remy Denner, Morgan McCurdy, Sophie Mercuris, Bailey Boese and goalie Val Daniels contributed to some huge defensive stops, allowing the offense to respond with a 4-0 run. 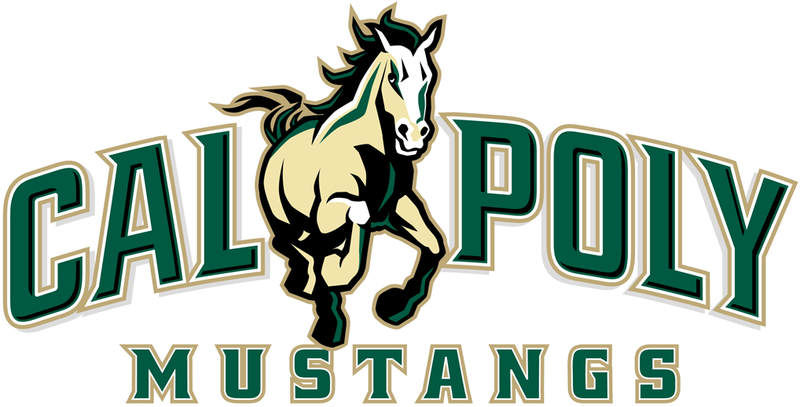 However, Cal Poly made a strong come back to take the lead with a 5-4 halftime score. The second half was intense, with many lead changes. With only a few seconds left in the game, the buffs were trailing by one. 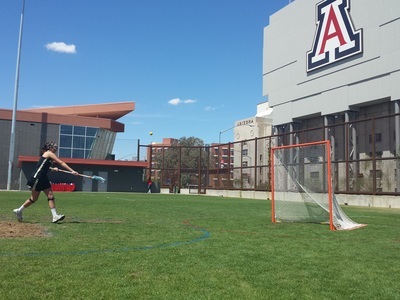 Goalie Val Daniels and defenseman Bailey Boese worked together to obtain the ball back against a stalling Cal Poly team - a play that ultimately earned Val the "game ball" voted on by her teammates. Following this caused turnover, junior Hannah Hilden-Reid came through with a huge goal to tie it up 7-7 and take the game into overtime! The buffs controlled overtime and put away three strong goals to win the game 10-8! We are proud to present the 2014 buffaloes! In just two short weeks, our buffs have already proven that they're dedicated and committed. 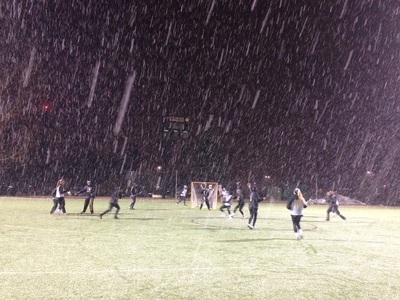 From snowy practices to early morning training sessions, these girls are killing it. Here's a glimpse at what we've been up to. Click on our roster page to get to know each a little better and be sure to check back here for updates throughout the season! We're happy to report that Fall Ball 2013 was a huge success! Tons of talent came out for our team and we accomplished a tremendous amount of growth in preparation for the spring season. It was announced that the National Tournament will be in Virginia Beach next May and we are prepared to do whatever it takes to get there!